A neglected kitchen is a sad sight. Of course, kitchens are never truly neglected; everyday activities of cooking and washing dishes occur in the kitchen. However, it’s often seen that not even a fraction of the pain and effort people go through for decorating and cleaning their living rooms or bedrooms go into the maintenance of their kitchen. A well-kept kitchen actually adds a different dimension to a house. The kitchen doesn’t simply have to be a place for drudgery, it can be a great place to sit around casually for the family and even for visitors. This requires the kitchen to be a bright and cheerful place; here are some tips on how to make that happen. Decorating a kitchen doesn’t really involve putting up expensive paintings, sculptures, vases and so on. In fact, that wouldn’t be the way to go about it at all. What you can do is work with the kitchen fittings. Wall racks, hooks, cupboard doors and so on can feature cheerful colour themes or pictures. The thing to keep in mind is that it should have a casual and happy feel about it and you shouldn’t really go too over the top with the décor. In terms of priorities, convenience should rule the roost. Cooking there should be an enjoyable process; all the utensils should be easy to access and there should be as much free space to work in as possible. 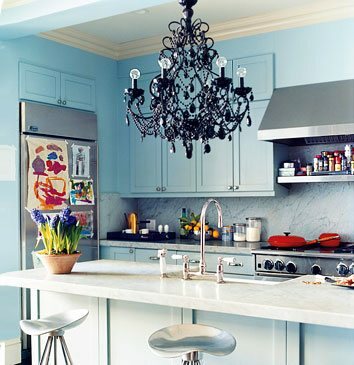 Space is a very important component in the kitchen. It’s often seen that when it comes to smaller houses and apartments, builders and house owners tend to compromise on the size of the kitchen to give more space to other rooms. This is a big mistake to my mind, because a small kitchen is really difficult to work in. However, if you are stuck with a small kitchen, there are a few things you can do to make the most out of the space available. The most important thing is to make use of the walls as much as possible. Using wall mounted racks and hooks, you can store all kinds of kitchen utensils, pans and so on, on the walls. This will save a lot of floor space and counter space, making your kitchen much easier to work in. Even fruits and vegetables can be stored in beautiful baskets that can be hung from the walls. This will not only save space for you, it can also make your kitchen look that much better. The most important thing to keep in mind is that the kitchen should not be a messy place with a clutter of equipments and utensils everywhere. Keeping the counters and tabletops free of stuff would, in itself, brighten up a kitchen. You can have fun stuff in the kitchen as well, like a small TV tucked in somewhere or a margarita maker to have a good time with. The basic idea is for the kitchen to be a fun place to cook in and a great place to sit around and spend your free time in. The easy to follow tips in this article were created by Jenny Fields. Jenny’s favorite thing to do and share with others is organization for living spaces. She shares most of this information at http://emicrowavecart.com where you can learn to better organize and maintain your house.